Artist's illustration of ExoMars' Schiaparelli lander about to touch down on the Red Planet on Oct. 19, 2016. Spaceflight history will be made today (Oct. 19), if all goes according to plan. 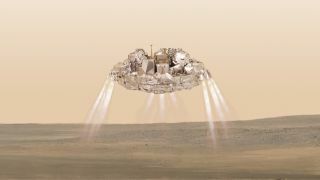 The Schiaparelli lander — part of the European-Russian ExoMars 2016 mission — is scheduled to touch down on the Martian surface this morning at 10:48 a.m. EDT (1448 GMT). You can follow the action live here at Space.com, courtesy of the European Space Agency (ESA). Russia's forerunner state, the now-defunct Soviet Union, pulled off the first-ever soft landing on the Red Planet with its Mars 3 probe back in 1971. But Mars 3 managed to beam home just one indecipherable image before going silent less than 20 seconds after touchdown. To date, ESA has attempted only one Mars landing, that of the Beagle 2 probe in December 2003. Beagle 2 stopped communicating with its handlers shortly after separating from its mothership, the Mars Express orbiter, and was never heard from again. NASA first landed on Mars with the agency's Viking 1 and Viking 2 landers in 1976. The American space agency waited two decades before trying its next Red Planet surface mission, which was also successful: The Pathfinder lander and accompanying Sojourner rover operated as planned after touching down in 1997. NASA's next surface effort, the Mars Polar Lander, failed in 1999, but the agency has been on a Red Planet hot streak ever since. The Spirit and Opportunity rovers touched down on planned three-month missions in January 2004, then kept rolling for years afterward; Opportunity, in fact, is operational to this day. NASA's Phoenix lander found strong evidence of buried water ice near the Martian north pole shortly after touching down in May 2008, and the agency's car-size Curiosity rover has been exploring the Red Planet since August 2012. Curiosity discovered that the area near its landing site hosted a long-lived lake-and-stream system billions of years ago, suggesting that Mars could have supported Earth-like life in the ancient past. The rover is now climbing the foothills of the 3.4-mile-high (5.5 kilometers) Mount Sharp, searching for clues about when and how Mars became the cold and dry world it is today. Schiaparelli won't be nearly as long-lived as Curiosity, Spirit or Opportunity, even if everything goes perfectly today and in the near future. The lander is a demonstrator that aims to prove out the technology needed to get the life-hunting ExoMars rover down on Mars in 2021. (The rover mission, which is slated to launch in 2020, is the second phase of the two-part ExoMars program.) Schiaparelli carries nonrechargeable batteries that will allow the lander to operate for a maximum of eight days on the Martian surface, ESA officials have said. Schiaparelli's landing attempt isn't the only spaceflight action on tap today. The ExoMars Trace Gas Orbiter (TGO), which launched toward Mars with Schiaparelli this past March, will fire its main engine for more than two hours this morning beginning at 9:04 a.m. EDT (1304 GMT) in a crucial orbit-insertion burn. If anything goes seriously wrong with this maneuver, TGO will sail right past the Red Planet. If the burn succeeds, TGO will then take its time getting to its final orbit. The orbiter will start sniffing the Martian atmosphere for methane and other potential signs of life in March 2018. This work will last for nearly two years, ESA officials have said. TGO will also be used to relay communications from the ExoMars rover to mission control on Earth through the end of 2022. ESA leads the ExoMars program; Russia's space agency, known as Roscosmos, serves as the main partner.